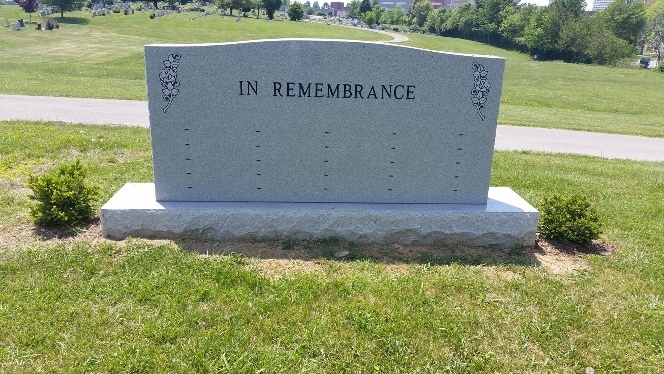 The Richmond Cemetery Company has installed a Remembrance Stone for the convenience of below ground interment of cremated remains without the added cost of purchasing a monument or grave marker. There are twenty-five spaces available on each side of the stone (five rows with five spaces in each row). The spaces are 2' x 2' and available for single occupancy only. Each single space is $400.00, with an opening and closing fee of $400.00 at the time of interment. Due to available space on the stone, engraving is limited to name, birth year and death year. Engraving service provider names are available upon request at the cemetery office.